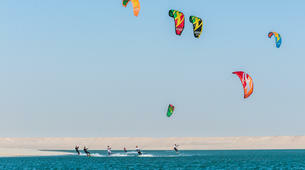 You wish to discover a new spot to ride in a heavenly atmosphere under the Moroccan sun? Going with your family or friends and want to enjoy a drink on your deck together? 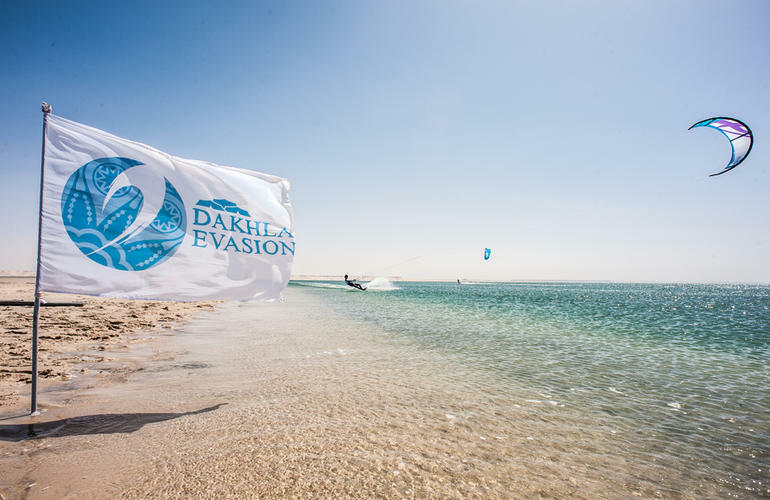 Sneak away with Dakhla Evasion! 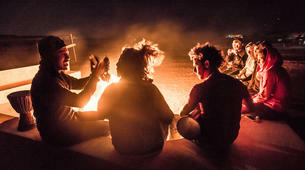 You do not need to care about anything, you just enjoy the moment! 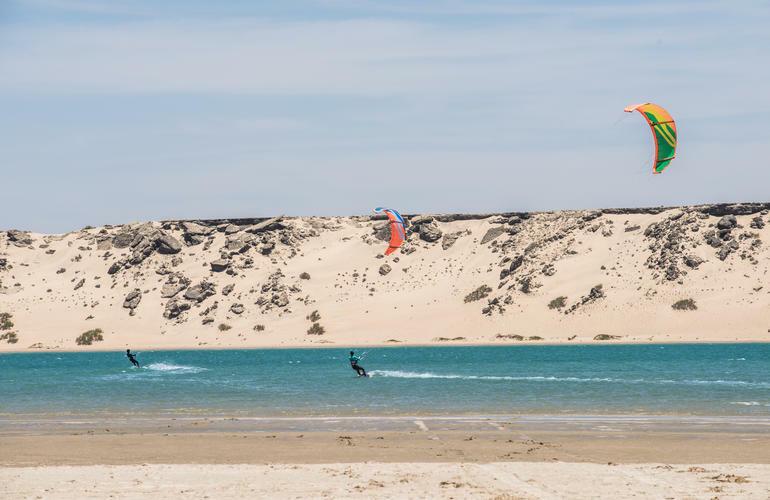 With Dakhla Evasion, you can live your passion for water sports in one of the most beautiful spots in the world, and also explore the city and the country, enjoy delicious seafood and excursions in the desert. 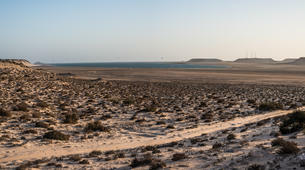 Dakhla, the "Moroccan Caribbean" borders the Atlantic, in Western Sahara, south of Casablanca. 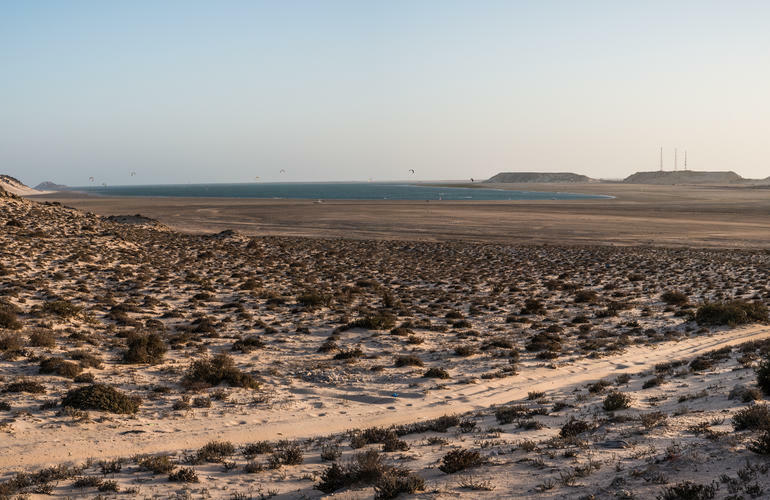 Between desert and ocean, in the extreme south of Morocco, Dakhla welcomes you along 40km of a beautiful lagoon surrounded by nature. 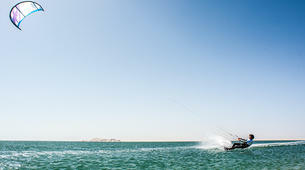 The bay is a dream location for water sports with over 300 days of wind per year. The waters are rich in fish and warm (19° C to 24° C). 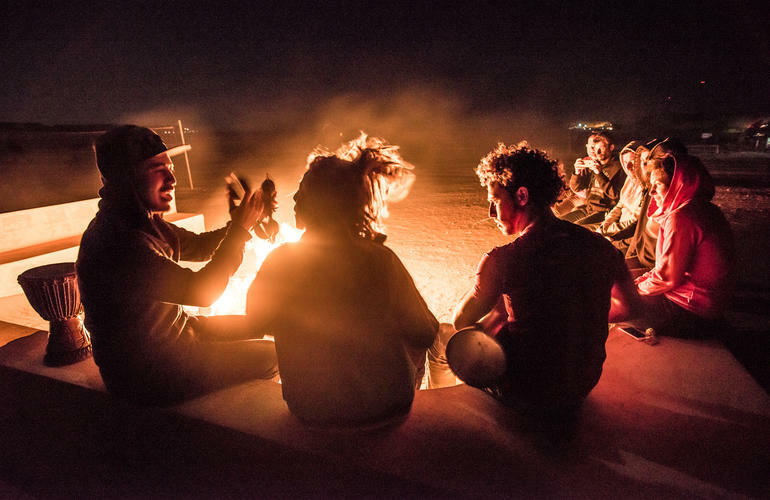 The main spot is in front of the camp. It is the first thing you see when you wake up in the morning. 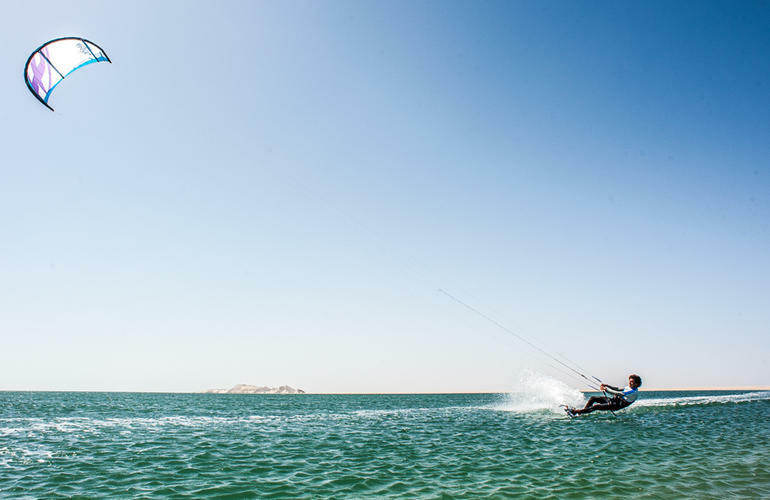 The wind is steady and the water is shallow: perfect for beginners or advanced levels. You may have the chance to sail with dolphins! 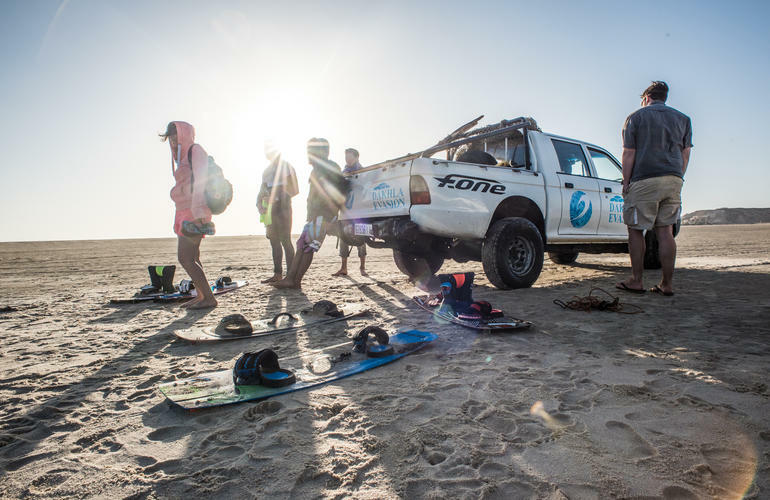 Once there, at low tide, you will understand the name "speed spot." 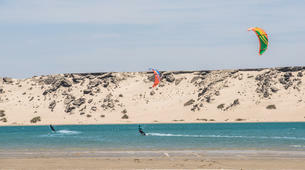 About 4km along the beach, you will find a perfectly flat and shallow water for speed. 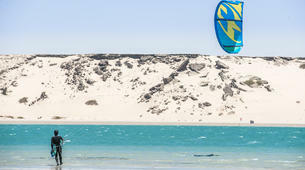 The famous white dune in Dakhla is an amazing natural phenomenon erected in the middle of the lagoon. Very large dune of white sand, with its own small lagoon. This is ideal for taking beautiful pictures and also a favorite place for flamingos. Perfect mix between a moderate wind and the beautiful waves of the Atlantic Ocean. 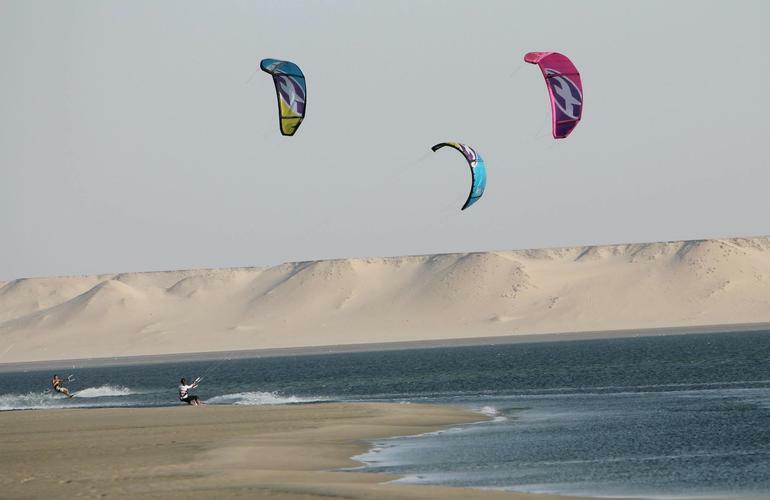 Great place to have fun and enjoy the long waves of the Sahara. 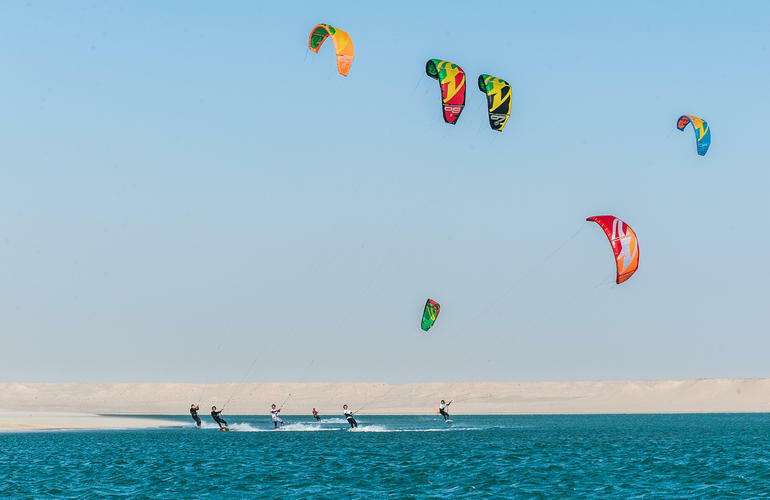 Rental apply to people who already have an IKO level 3 certification or anyone with a very good kitesurfing level, which will be checked by the instructors after a one hour test session. 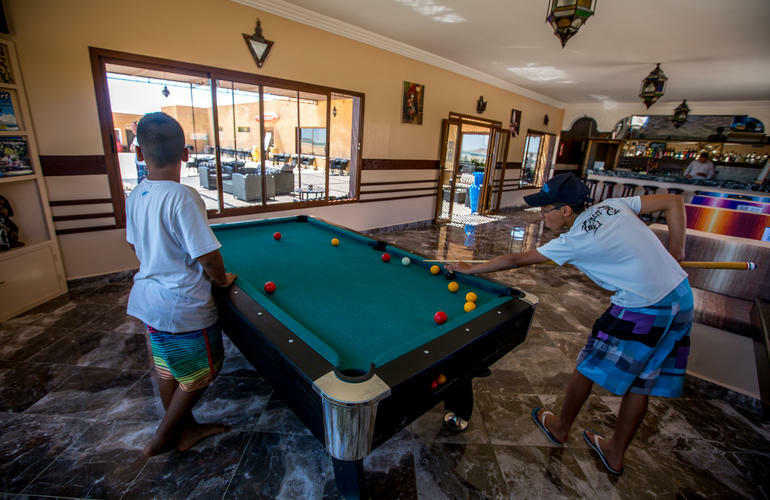 The school is accredited F-ONE, with equipment regularly renewed and always of the year. They have a wide range of equipments for all levels. 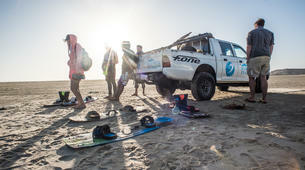 Rental includes : wetsuits, harness, impact vest and helmet. Insurances are optional. A normal bungalow sleeps 2 people (double or twin beds). 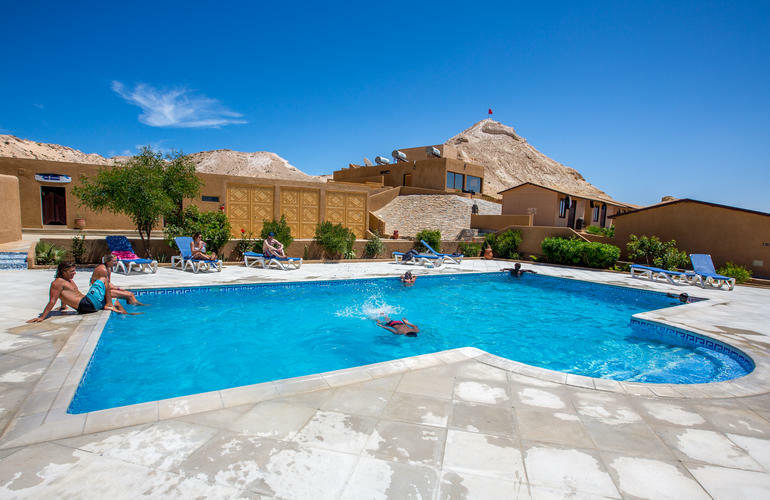 - Bed linen and towels are provided. - A sheltered terrace with a beautiful view of the spot. 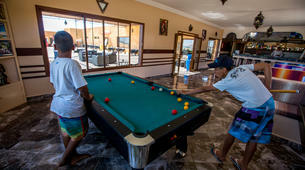 - A living area and a terrace sheltered from the wind with a beautiful view of the lagoon. 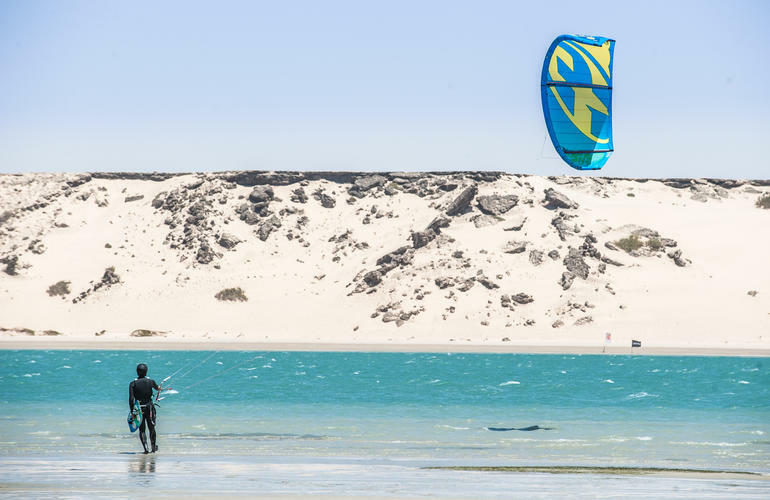 3 nights and 4 days during which you will discover the beautiful kitesurfing spots of Dakhla freely with the quality equipment of the Camp! 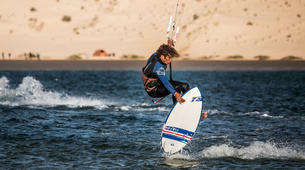 Participants must have a Level 3 IKO certification or justify an advanced level of kitesurfing. Children: free for children under 5 years and 30% reduction for children under 12 years. 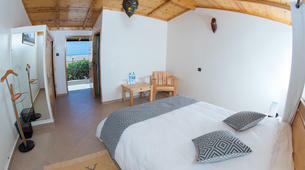 When booking, if you are 3 or 4 people, you will automatically go to Family Bungalow (2 bunk beds and 1 double). 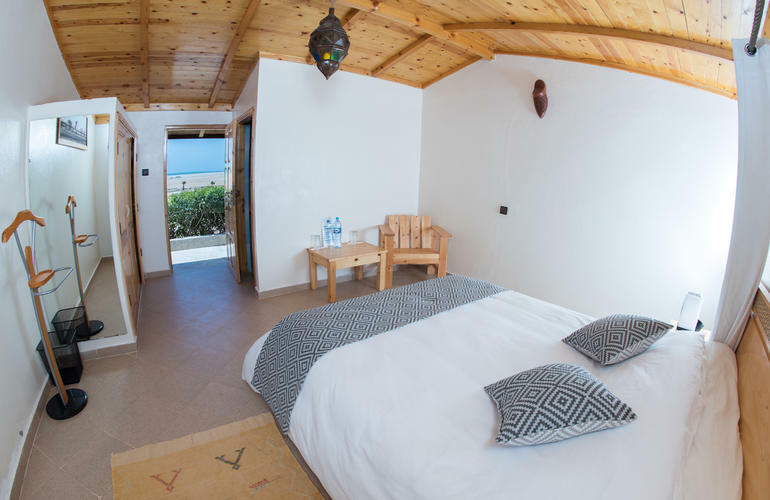 If you wish to book two bungalows, please book twice for two. 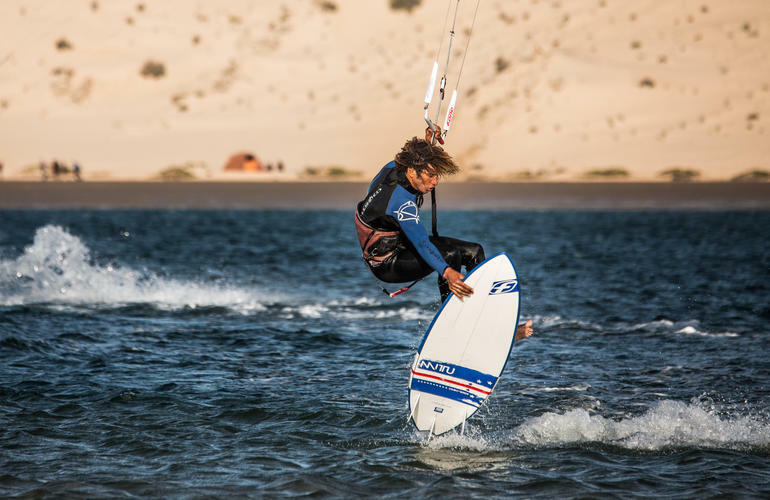 7 nights and 8 days during which you will discover the beautiful kitesurfing spots of Dakhla freely with the quality equipment of the Camp! 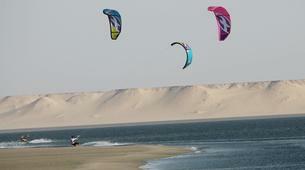 Good kiting but little else when there is no wind.